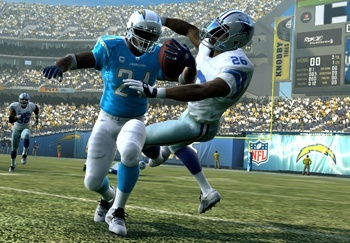 A pair of gamers recently decided to sue Electronic Arts over the Madden NFL franchise. The suit alleges that after securing exclusive videogame rights with the NFL, NCAA and Arena Football League in 2004, which essentially forced 2K Sports from the genre,EA took advantage of its virtual monopoly to inflate the price of 2006 version of the game by almost 70 percent. It goes on to say that EA's actions add up to "blatantly anticompetitive conduct," and seeks damages for anyone who purchased an EA football title since August 2005 as well as a return of profits resulting from the deal and an annulment of all related contractual agreements. It's an interesting spasm against an intractable corporate juggernaut, made more so given that EA now finds itself under the FTC magnifying glass as a result of its struggle to swallow Take-Two Interactive. But is this latest footnote in EA's litany of supposed bad behavior really worth anything more than a glance and shrug? Yes, EA is a soulless monolith. Yes, it eats the souls of the studios it assimilates - and there have been a few good ones among them. Yes, the Madden NFL franchise is a tired old beast that, despite Peter Moore's insistence to the contrary, is about as far removed from "innovation" as a game can be while still making use of the English language. Moral indignation aside, though, I have to wonder what exactly it is EA has done to earn itself a berth in civil court. I should make two things clear right away: I am not a lawyer, so I speak from a position of litigational ignorance, and I'm not an EA fanboy (if such a thing even exists anymore) so I have no reason or desire to defend the company from the gibbering hordes of gamers whose interest in the case begins and ends with a vague yet hot-blooded desire to stick it to The Man. I'm simply a disinterested observer who fails to see any substance to this case beyond a couple of gamers pissed off at having to pay overly high prices for a half-assed product. Which is of course where the whole thing starts to fall in on itself. You don't have to pay excessively high prices for it. You will not starve, drown, be shot or stabbed, immolate, strangulate, exsanguinate or otherwise suffer life-compromising consequences if you don't play Madden 2006. Or 2007, or 2008. And there are numerous perfectly reasonable alternatives: You could, for instance, keep on playing last year's Madden game. Or you could pick up a copy of 2K's All-Pro Football 2K8. You could go even outside and play some real football over the weekend and maybe work off some of that GTA gut. You could also, if you're the open-minded sort, switch sports; perhaps play some baseball on your 360. That's certainly not going to be a problem, as long as you're willing to pay 2K Sports' price for Major League Baseball 2K8 - currently $59.99 at EB Games, rather more than the current price for Madden NFL 08. 2K Sports holds the exclusive rights to produce official MLB videogames, you see, a deal they made in 2005 at the expense of previous license holder EA Sports. Yet surprisingly, or perhaps not, there's been no hue and cry whatsoever over the exclusivity of that particular arrangement.